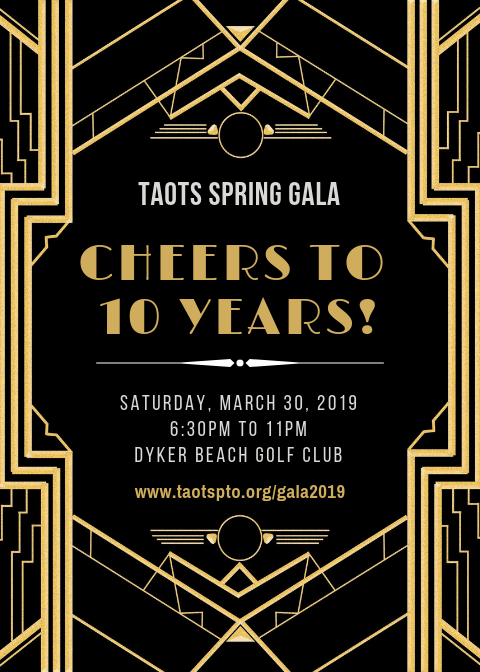 The PTO of TAOTS will be hosting its annual spring gala on Saturday, March 30, 2019 at the Dyker Beach Golf Course at 6:30pm. This year’s gala will be especially momentous as we celebrate 10 years of dedication, inspiration and enrichment at TAOTS! We encourage you to review the attached sponsorship and donation solicitation materials to determine the best ways you can contribute to what promises to be another inspiring and memorable event. We had great success with our sponsorship tiers and gala program last year and hope to see continued support and participation.